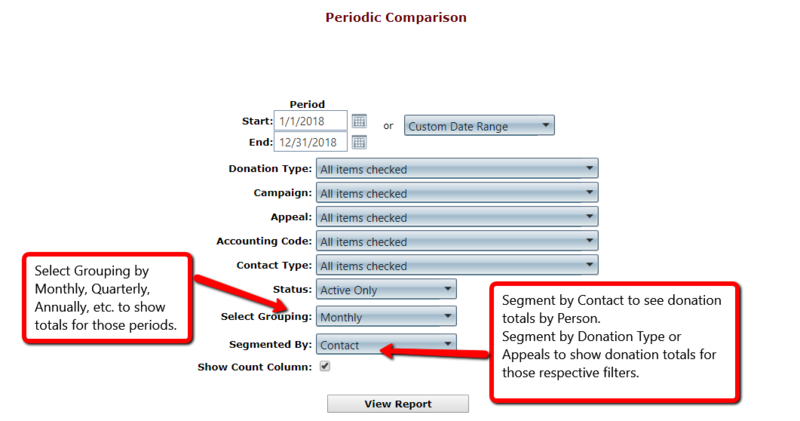 The Periodic Comparison report exports your donation totals in different time periods to Excel. With this report, it’s easy to compare things like donations by donors for the past 5 years or the performance of each campaign or appeal month after month. The Excel export of the Periodic Comparison report will show totals based on the date-range, grouping, and selection chosen on the criteria page. It will also Contact information such as Address, Email, Phone number, etc. when you run this report segmented by contact. To compare the giving to each campaign over time, choose to segment your report by Campaign instead of by Contact.